Tegan and Sara (pronounced /ˈtiːɡən æn ˈsærə/) is a Canadian indie rock duo, made up of twin sisters Tegan and Sara Quin. They are lesbians. They have released eight albums. At first they called themselves PLUNK. 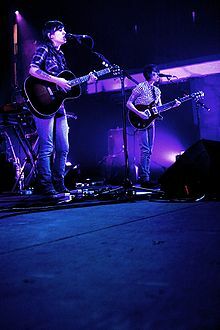 They released their first album, Under Feet Like Ours, in 1999 as Sara and Tegan. In 2000 they released The Business of Art, their second album. They were nominated for four prizes at the 2014 Juno Awards. They are feminists. ↑ "Tegan and Sara's official MySpace". ↑ Smith, Caspar Llewellyn (17 January 2013). "Tegan and Sara: 'We wanted to explore a different side of ourselves'" – via www.theguardian.com. ↑ Quin, Sara (11 November 2012). "Rookie » Sunday Video: Ask a Grown Woman With Tegan and Sara". www.rookiemag.com.